A mom wrote that her biggest parenting challenge is to discipline without screaming and threatening. This is a common parenting struggle as it’s a very natural reaction to increase your volume when your kids don’t obey the first time. Before you know it, you’ve added threats to try to force them to behave. When you start yelling and threatening, you really let your kids off the hook for their poor behavior. Now they can focus on your out-of-control behavior instead of their own misbehavior. If you can remain calm and actually lower your voice, you will be in a more powerful position. By remaining composed, you can hold your kids accountable for their behavior without escalating the situation. Is it easy? No! But I learned to change my screaming into calm, confident parenting and you can too! 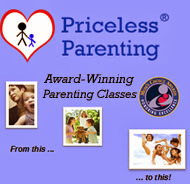 Discover the effective parenting ideas in Priceless Parenting’s online parenting classes.